Based (very loosely) on the 1960s television series. My take: so very much a Guy Ritchie movie. A very well-done live-action cartoon. Impeccable production design, gorgeous cinematography that authentically captures the feel of 1960s Italian Cinema. Typical for Guy Ritchie, the set pieces are very good—frenetic and yet still easy to follow. On the other hand, they could have at least made an effort to make me care about any of the characters. Also, for a few scenes, Ritchie really ought to have let things slow down a little and let the dramatic tension build, rather than quickly cutting away. I think I learned my lesson from his previous Sherlock movies and it's really helped (relatively vapid characterisation etc). I was lurking in the fandom for the show yeaaaaaaaaaars ago, so I know I'm a natural audience for this, but I'm still not sure why it had to be made in the first place. Still, I got a big-screen!Ilya who's all :< for pretty much most of it, so that's a plus. Does David McCallum have a cameo? Stylish and fun and gorgeous, but ultimately lacking in any substance. I did very much enjoy the retro feel though, and really liked Gaby. I enjoyed that a lot more than I thought I would. It was Guy Ritchie without being all Guy Ritchie-y, it was smarter than it had any right to be, there were some genuine laughs, and it looked gorgeous. My only criticism is that it tries to put forward the premise that the CIA wanted to stop fascists in Europe after WWII. So far I've only seen the ads that have been saturating Tumblr lately but Elizabeth Bedecki looks so much like Grace Kelly I thought it was a remake of To Catch a Thief, until I saw the title. The tv show casting was original and offbeat (and fluky - nobody expected David McCallum's Illya Kuryakin sails to catch so much "Swinging England" Beatle haircut wind). This movie has two conventional leading man types. Understandable but gutless. Fan of the original. Illya Kurakin was a childhood crush for me. Saw it yesterday and was pleasantly surprised since I wasn't expecting much. I did like the styling and setting--just absolutely gorgeous shots of Rome and it's environs. The cast was fine, the comedic moments were silly and I did laugh. I did like that the action wasn't the focus--it made it more light-hearted and fluffy. Yeah, the characters weren't deep but I wasn't expecting grimdark and would have been pissed if it went that way. Elizabeth Debicki is amazingly beautiful and really well-cast. She captures that 60's socialite vibe, kind of Talitha Getty or one of the Agnellis. I enjoyed it, but there were three serious downchecks. First, cardboard Nazis are a questionable choice even if they are in period. Second, I'm over origin stories. Third, Armie Hammer did a good job with what he was given but he's not ever going to be Illya Kuryakin, sorry. However, apart from these quibbles (and the fact that the last two really sort of make it not a Man from UNCLE movie), it was a lot of fun and really captured the spirit of the 60s for me. It was kind of methadone for my long-dreamed-of retro Bond movie crack, to mix my terrible metaphors. I liked it a lot, especially Cavill's approximation of Robert Vaughn's swagger, but my main disappointment is that the TV series has one of the best theme songs of all time, and the movie only used about five seconds of it in a throwaway gag. The hell? I finally got around to renting this and despite a perpetually skipping DVD, really enjoyed it. Not enough depth and the pacing could have slowed down to let things breath, but gosh, it was pretty and fun to look at and very breezy. Going to rent it again via iTunes to hopefully see it all in one piece this time. I didn't know about the tv show before going to the movie - I basically saw the trailer and decided that two good looking, well dressed dudes in a reasonably interesting plot was worth going to see. I was surprised at how enjoyable the movie was. The characters were reasonably well developed for such a fast-moving plot. 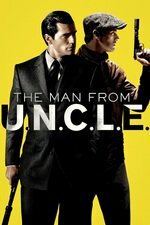 At the end it did feel like I had just watched a really long and well done trailer for another spy movie (just that the whole movie set up the formation of the Man from U.N.C.L.E. ).